In their first meeting since the Premier was elected in October 2018, Grand Chief Dr. Abel Bosum and representatives from Cree Nation Government had a chance to sit down with the Premier and discuss issues surrounding Cree Governance. On December 10, 2018 the Grand Chief Dr. Abel Bosum and Premier François Legault had the opportunity to meet for the first time since Mr. Legault’s appointment as Premier in October. 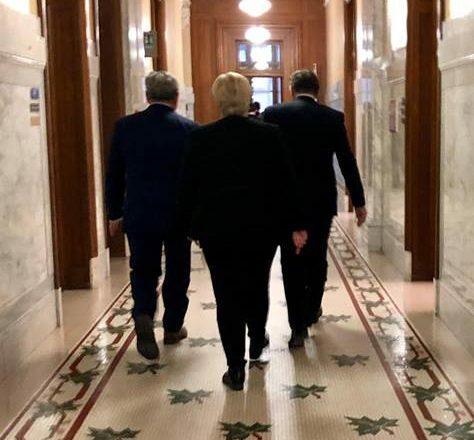 The newly elected CAQ Government met with representatives from Cree Nation Government to discuss a number of issues that were important to a successful partnership into the future. Among these issues were:; the importance of Cree-Quebec relations, continued implementation of the JBNQA and its evolution, renewal of agreements stemming from the JBNQA, social and economic development, and Cree governance in Eeyou Istchee. This initial meeting represents an important first step towards continuing a relationship between the Government of Quebec and the Cree Nation. Continuing efforts to build a mutually beneficial relationship will rely on tackling issues important to the Cree Nation including housing, education, social services and protection of the environment. These issues are vital to the preservation of Cree way of life while improving the quality of life for all people that call Eeyou Istchee home. Statements - Abel Bosum: Quebec Mines + Energy Presentation "Banking on Peoples Rights: The Business case for Respecting Indigenous Rights"